A final reading challenge to take a bash at for the coming year. 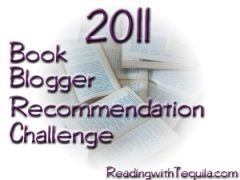 This one I plan on starting in January 2011. Then, choose your books from the list of Book Blogger Recommendations, and get reading! Note: You do not need to have your list of books picked out before the challenge begins. I’m always looking for book rec’s and this seemed like an ideal place to start plus I have already read 35 out of the 413. A couple of my theoretical choices will cross over into other challenges, specifically the reading of 15 books from ‘1001 books to read before you die, also from my TBR 40. So I guess I will definately go for Level I and possibly move myself up to Level II… we shall see. This entry was posted in Reading Challenges, Reading lists and tagged Book blogger recs 413, books, reading challenges. Bookmark the permalink.